A: Simple! The easiest thing to do is fill out an application. The process is free, and pre-approval is quick and easy. You can apply either online by clicking the “Apply for Credit” tab above and selecting the store you wish to shop at, or by calling any of the locations at the numbers listed at the top of the page. Q: Can I trade my current vehicle in to you? A: Yes, provided you have a title in your name and the vehicle has no current liens against it. A: Without seeing your trade, we can’t give an accurate assessment of it’s value. 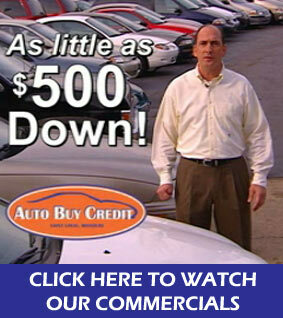 We will appraise your vehicle for free once you have completed the credit application. Q: My trade does not run, is that okay? A: Yep! Even if the vehicle has to be towed, we can still accept it. Q: Can I pick any car I want on the lot? A: Absolutely! As long as you can meet the down payment requirement, you are not limited to any vehicle and are free to pick the one that best suits your needs and desires. Q: I’ve bought a used car before, and I’m nervous because I had to spend a lot of money just to pass safety and emissions inspections! A: Don’t worry! At Auto Buy Credit, every car we sell has been safety and emissions inspected, so you won’t have to come out of pocket at a repair shop just to get the vehicle licensed. Q: How often do you get new inventory in? A: Although there is no set day that we recieve inventory in shipments, we are constantly buying as many vehicles as we can to make sure we have the selection you want. If you are looking for something specific, the best thing to do is call one of our experienced Sales Representatives and let them know what you want!